A no show is treated as a cancellation and the total for the first night of the reservation will be charged. Guests under the age of 16 years old need to be with their parents / guardians. No stag or hen parties (bachelor or bachelorette). 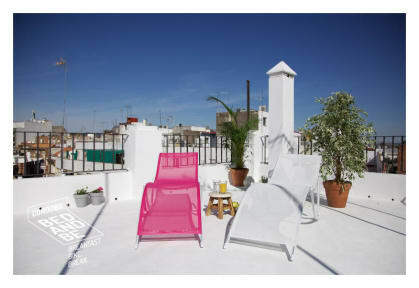 BEDANDBE is a TOP RATED Hostel on José Cruz Conde, main commercial street in Cordoba city center. It is the Lonely Planet selection and top rated hostel in TripAdvisor works as a hostel/bed&breakfast, new, clean and complete, ...with local hosts, bicycles on the ground floor, a roof terrace and beautiful attic on the top floor. Free bike/walking night tapas tour, the walking tours, Sushi dinners, BBqs are some of the daily activities at the hostel! It is a charming place with 10 bedrooms: twins, 4 and a 8 beds dorms, (both with individual lockers). All rooms have big windows or balcony and their own AC. There is also a lounge with a big Tv, sofas, arm chairs,dinning tables, even a rocking chair.The high ceilings and the many tall windows that are west-facing and look out onto the promenade, make the hostel feel very light and peaceful. We have also incorporated all the comforts of modern life too, like: air conditioning, WIFI, Led TV, and all types of appliances (dishwasher, washing machine, dryer, induction kitchen, microwave fridge and freezer, coffee maker, kettle, toaster) in a fully equipped kitchens, and 7 spotless bathrooms. The hostel is placed on the downtown of the city. From foot you can easily access all the city main sights. The staff was excellent, very nice and attentive. The showers, as well as the lockers, are good. It's a great place, and I'm sure I'd return if I have a chance. A localização é boa, fica entre a região turística, a parte comercial da cidade e a estação de trem. O ambiente é alegre e agradável. Os quartos são muito bons e confortáveis, e a equipe foi super atenciosa e me deu várias dicas sobre a cidade. Voltaria a me hospedar aqui! Em nossa estadia de duas semanas na Andalucia este foi o melhor Hostel. Não apenas pelo ambiente e localização, mas especialmente pelo tratamento da equipe e simplicidade da organização. Best location, best staff and best hostel in the city. Very friendly staff, clean installations, good A.C. and good shower. Not a party hostel but easy to meet new people. Very welcoming atmosphere that make you feel you are home. Hostel mais bem cuidado que já fiquei. Tudo muito limpo e bem arrumado. Duas cozinhas à disposição, terraço e sangria grátis à noite. Único ponto é que tem poucos banheiros, se o hostel estiver cheio pode ser um problema. A equipe do hostel são as pessoas mais amáveis que você poderia conhecer, super atenciosos! O mapinha da cidade é super legal e com boas dicas. Todos os dias tem saída para tapas às 20:30, super recomendo! O café da manhã também é super gostoso, você pode fazer seu próprio suco de laranja. Mas venha com poucas malas, porque o prédio é antigo e não tem elevador, e o espaço dos quartos é limitado. Muito caro para o que é oferecido. Café da manhã pífio. Não há elevadores e me colocaram no alto. Não recomendo.